Whether you’re a local or a visitor there’s a lot of magnificent art and exceptional cuisine in the Wynwood Arts District of Miami. Enjoy a full range of tastings while roaming from one great restaurant to another, sampling the cuisine from some of the best kitchens in town. From the street art to acclaimed restaurants and world-renown art galleries, if you’re looking to discover the area in just a few hours, join our local expert guide for the best of what Wynwood has to offer. The Wynwood Arts District is home to over 70 art galleries, retail stores, antique shops, eclectic bars, local breweries and one of the largest, open-air street-art installations in the world. Learn about the different styles of graffiti and mural art from an expert art curator. Explore the history of Wynwood and discover how it became the mecca of art it is today. Hear stories about the people who helped to build and transform the neighborhood from abandoned warehouses to the largest outdoor museum in the world. Sample delicious cuisine and discover what makes them special while your guide covers the culture behind the food. Your expert local guide is wildly passionate about Miamian cuisine and will share her love of food and culture with you. 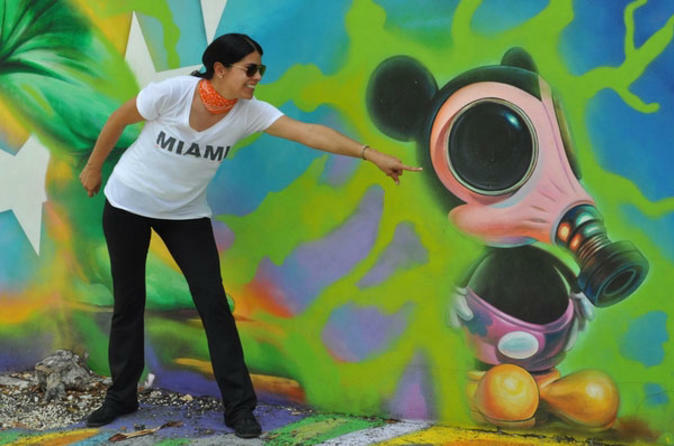 By choosing our top-rated Miami Food and Art Walking Tour of Wynwood Neighborhood, you will have the opportunity to experience the best of Wynwood in a 2.5 hour walking tour.